Who cares if your train’s on time if you’re not on time? 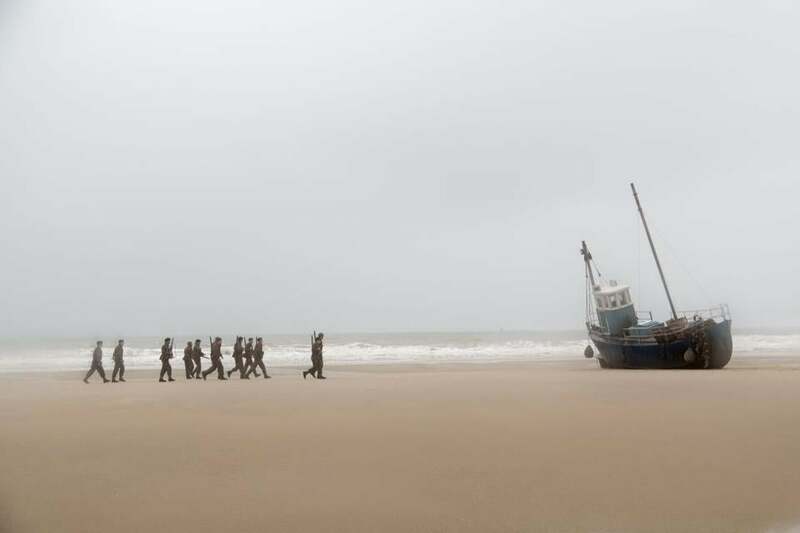 A scene from “Dunkirk,” Christopher Nolan’s film about the 1940 evacuation of 330,000 Allied soldiers after the fall of France. Christopher Nolan’s unpredictability is almost as rare as his talent for visual sweep and narrative invention. Nolan, 46, is best known for his “Dark Knight” trilogy (2005-2012), which took superhero movies deeper and darker than they’d been before — or since. Yet he’s also told a story backward (“Memento,” 2000), remade a Norwegian thriller (“Insomnia,” 2002), conjured up 19th-century magicians (“The Prestige,” 2006), invaded dreams with criminal intent (“Inception,” 2010), and sent Matthew McConaughey into outer space (“Interstellar,” 2014). Now he’s made “Dunkirk.” The title tells you the subject: the successful evacuation of 330,000 Allied soldiers after the fall of France, in 1940. The cast includes Kenneth Branagh, Mark Rylance, Tom Hardy, and Harry Styles, of One Direction fame, making his film debut. But none dominates the film, which really does have the proverbial cast of thousands. In addition to writing and directing “Dunkirk,” which opens in Boston Friday, Nolan produced the film with his wife, Emma Thomas. The Globe's top picks for what to see and do each weekend, in Boston and beyond. Nolan intercuts three stories, pegged to durations: one week, for the soldiers trapped on the beach; one day, for Rylance, sailing to help with the evacuation; and one hour, for Hardy and other Spitfire pilots crossing the English Channel to repel the Luftwaffe. 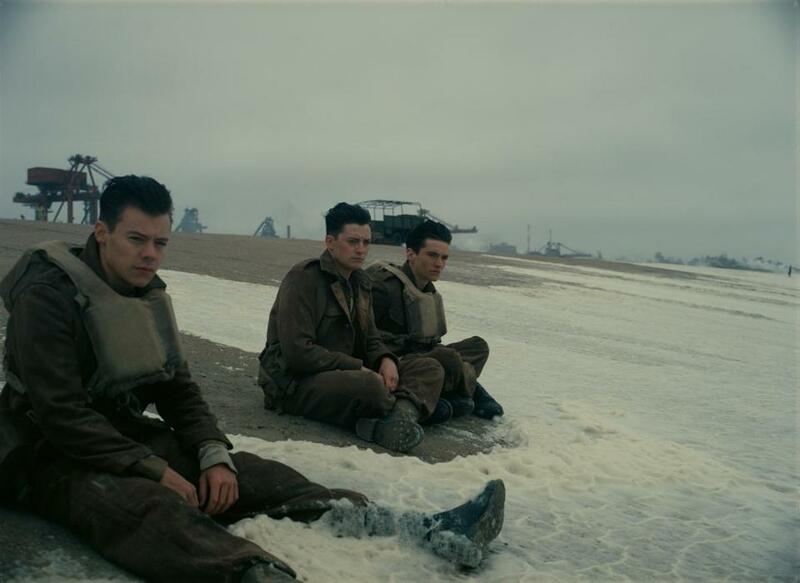 “Dunkirk” runs 107 minutes, brief by Nolan standards. That’s because he conceives of it as already being in the “third act,” ratcheting up intensity and drama. Earlier this month, he spoke by telephone from Los Angeles. Q. This is a different sort of epic. A. I consider it an intimate epic. I wanted to tell this story from a very intensely subjective series of points of view. I wanted to achieve the feeling of scale, because it’s one of the biggest stories you can imagine, but I wanted to do that by adding in these very different points of view. Q. Does Dunkirk have a special meaning for you? A. Well, like most British people I grew up with this story in my bones. I don’t even remember when I first heard it. Twenty or 25 years ago, Emma and myself crewed a small boat for some friends of ours and decided to go to Dunkirk. The Channel did not behave itself. It was arduous and frightening. The sea felt very threatening — and that was without bombs falling on us. My admiration for the people who made that crossing [during wartime] was absolutely cemented. I carried that with me for many years, and ultimately it became a story I wanted to tell. It’s also one of the greatest stories in human history — and it hasn’t been told in modern cinema. That’s what you’re looking for: huge events that haven’t been seen before onscreen. Q. Is defeat more interesting than victory? A. I think that fact makes this very appealing as a story. I would be very daunted taking on a war film. I never fought in a war, so that would be presumptuous of me. Instead, Dunkirk is a survival story. It’s a defeat that becomes a victory. The sum of individual acts becomes more than the whole, and there’s such a power to that, distinguishing it from other war films. Q. How important for you was that tripartite structure in organizing the film? A. The process I went through on this film was first to research the events, especially reading firsthand accounts. I knew I’d take fictional characters to tell the story. I did the structure: rigorously, mathematically, even geometrically. The structure is based on a musical principal, the Shepard Tone , which I’ve used in various scores for my films. It involves music continually rising in pitch and the emotional effects that can have. So I wanted to create a structure to bring in the various viewpoints and create a sense of things tumbling forward. Q. There are moments when the tumbling stops. It ebbs and flows. There’s . . . syncopation? A. I would refer to it as modulation. A. Exactly. I wanted to create a film that was based on the third act of a film, when so much tends to happen, and getting more than the sum of the parts. You start with absolute intensity, the sound of gunfire, but you want to modulate from that. After beginning with that third-act action, the lulls can be relatively short and simple, because everything is sharper and intense. Q. Yet at the same time, you open with such an unexpected, and unexpectedly calm, image: German propaganda leaflets falling from the sky. A. I just found it to be so compelling: this fluttering down of leaflets. I learned about it from my historical research. My historical adviser, Joshua Levine, was able to throw things like that at me. He said, “Did you know this [about the leafletting]?” As soon as I learned about it, I thought: What an amazing thing. Not just visually: These soldiers, who are cut off and completely uninformed about the larger situation, are getting their information from German propaganda. Q. You’ve done period before, with “The Prestige.” But that’s not something you’re associated with. A. I think for me the reality of the historical events and the importance British culture sees in them was extremely daunting. The responsibility felt heavy. Indeed, just two days ago I had the experience of screening the film for some of the few surviving veterans. Looking at them in the theater was one of the most remarkable experiences I’ve had. You have to be enormously respectful of that. Q. How did the veterans respond? A. It was an emotional screening. I wouldn’t want to speak for them. I was very relieved, I’ll put it that way. A. One of the things you’re seeing is order in the midst of chaos. There’s an absurdity to that, but there’s also tremendous strength in that. That’s the nature of hierarchy and the army and rules. At Dunkirk, you find this extraordinary tension between order and anarchy. We wanted to bring that home for people. Q. What was it like working with Harry Styles? A. Well, I set out to cast unknowns for the leads, and in movie terms Harry is unknown — even if he’s not unknown to a large segment of the population, let’s put it that way. But he just earned the part. We looked at literally thousands of people, and he spent days and days doing workshop auditions. It was great to work with someone so talented and with such charisma. What Harry does in the film I hope people will appreciate. What he does is very difficult. It’s not theatrical. It’s truthful to the spirit of the story. Q. When the evacuation flotilla arrives, you show it through a series of close-ups of Branagh. Was he following your direction or did you let him play it his own way? A. Hey, it’s all in the directing, man [laughs]. In truth, that moment is, obviously, in some ways the most important in the film. I’d not worked with Ken before. I’d written the moment slightly differently. We talked about it a lot, and he talked about what he wanted to do. I went away and rewrote based on our conversations. By the time we were at the end of that [pier], he was there. He didn’t need anything from me. He got from me what he needed in advance. I think his massive experience as a director was part of that. It was just a gift. Interview was edited and condensed. Mark Feeney can be reached at mfeeney@globe.com.